FalconBlog--Triumphs and Trials in the BGSU Falcon Nation: Red Zone Stats--is BG last? First, underscoring the point, BG is 4th in the MAC in getting into the red zone with 37 trips. BG is 12th in scoring percentage. 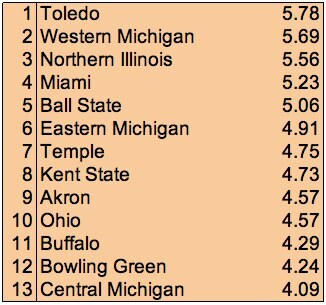 BG is the only team in the MAC with 10 non-scoring red zone trips. Buffalo is next with 7. In fact, 7 of the 13 teams in the MAC have 4 or fewer. As you know, I like to measure red zone production by a different number, which is average number of points per trip. The percentage method rewards TDs and FGs just the same, and sometimes a redzone FG is a victory for the defense...in fact, that is probably true in most situations. Anyway, using this method ((7xTD+3xFG)/Trips) we see that BG is....well, 12th. Central is 9th in percentage, but half of their scores are FGs, so they are 13th in this, the correct and right way to measure red zone productivity.